We crawled out of our tents at about 6:00 to see a light dusting of snow covering the slopes and our tents. The brown of the satellite image above had been replaced by the scene you see below! looking across the Parsye Khola riverbed at the Batsyak camp just after 7 a.m.
Wes started off by walking up the river about 400 meters before beginning our ascent of a switchback trail. The initial section – about an hour -involved some fairly tenuous footing on the gravel slopes as we gained some altitude. My trekking poles – the down-slope one 12 cm. longer than the up-slope one – helped. For a moment my mind turned to a consideration of how much my backpack would protect my body if I went tumbling down the steep slope! Our high point of the day, Batsyak La, would also be the highest point so far of our trip at 5450 meters; that is 560 meters higher than our Batsyak Campsite. Eventually, the drama passed and what you see below is what the rest of the walk up to the pass looked like. 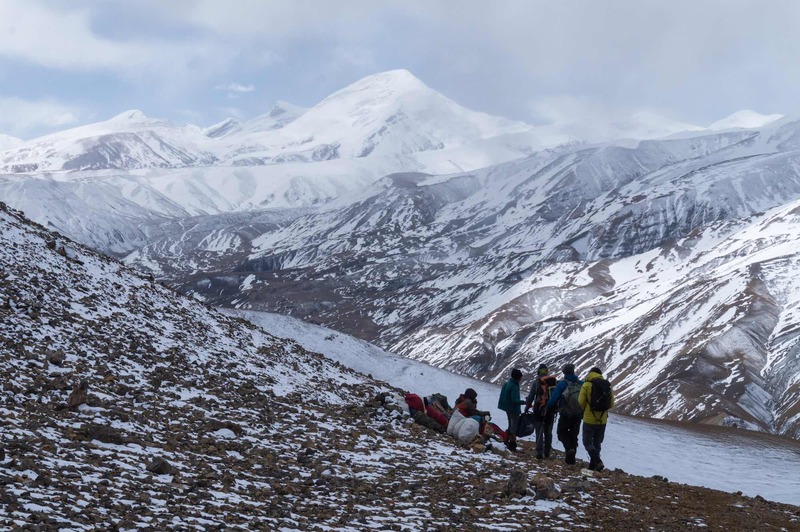 Batsyak La comes within the first 1 1/2 hours of leaving our camp – a gain of 560 meters in very little time. 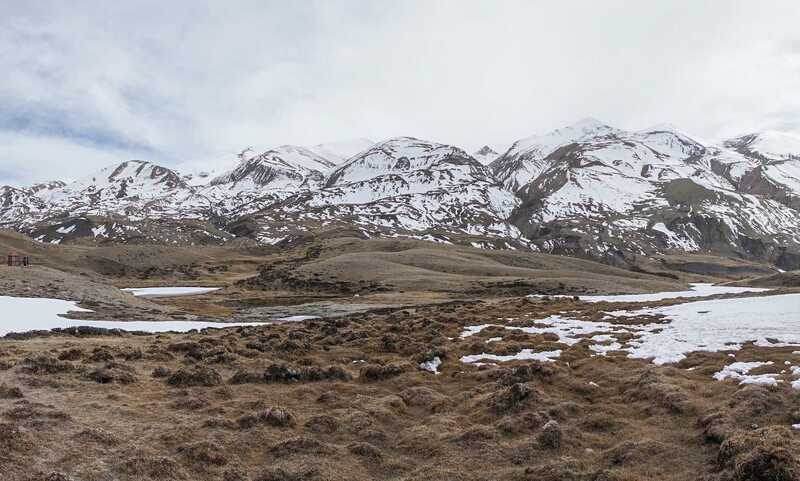 It provided us with a nice bit of further acclimatization at a higher altitude for a couple of hours before we descended down to the Damodar Kunda campsite and an altitude about 100 meters higher than the previous night’s. “Walk high, sleep low” in action! 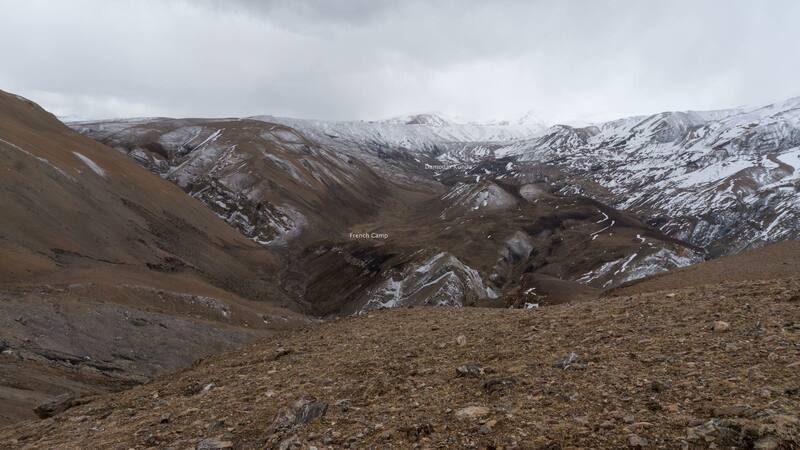 The pass is really a kilometer-long plateau with no more than a 100-meter change in altitude from one end to the other. It was the point where I finally felt that I was in the Himalayas! Looking east and south, the views were stupendous, awesome, wow-inducing…it was one of those moments where you acknowledge your good fortune to be healthy and wealthy enough to be in that very spot and take it all in. After Batsyak La it is easy downhill walking on a path like the one you see in the image below to the Dhechyang Khola and the French Camp. Down at the Dhechyang Khola, I stopped for a water/Clifbar break and looked across at the trail winding around the hillside. Given the substantial cairn, I thought we were at Damodar Kunda! Expecting to see three little ponds as I rounded the corner, I was instead looking up a long flat valley with no “lakes” in sight! 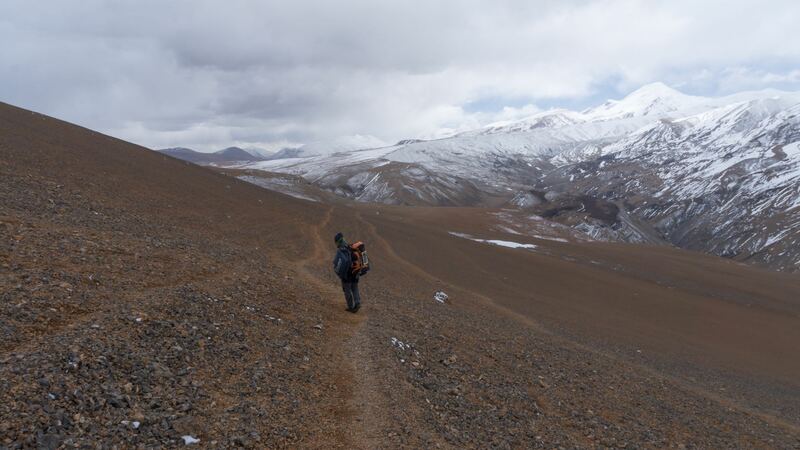 As for Tsering, Bill, and Rob – they were already about one kilometer up the valley. It was only later that I found out that the campsite above the bank of the Dhechyang Khola is called the French Camp. There was just a bit more walking to do before Damodar Kunda, tucked behind a ridge on the horizon, would come into view! 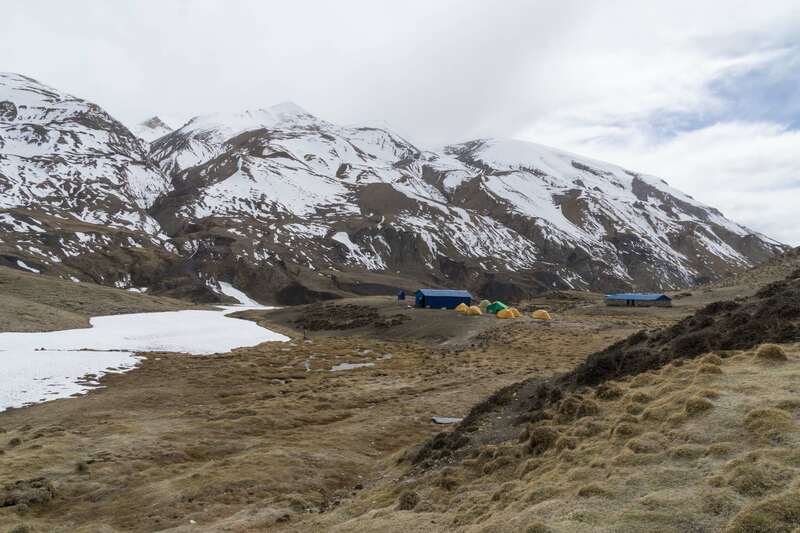 the French Camp on the south side of Dhechyang Khola – not quite there yet! We got to Damodar Kunda just after 1 p.m.
Damodar Kunda – within 1000 meters and yet not visible! We walked into Damodar Kunda from the bottom of the image above, passing the first “lake” on the left. This pond is known as Tamra to devotees; later we would walk up to the Rajat and Neel ponds near the metal shrine box. 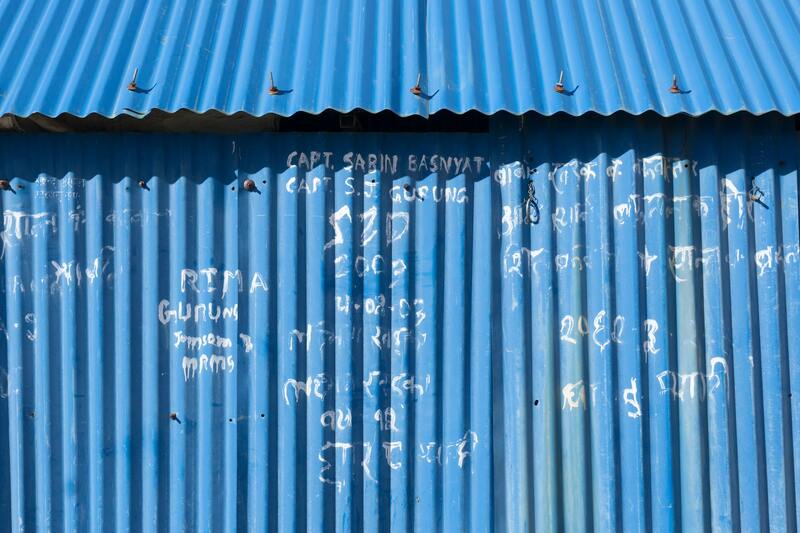 the second one – newer since it does not yet appear in the Google Earth satellite image – with blue corrugated tin walls as well as roof. Nearby was a structure with roof and doors containing two toilets. Both were full to overflowing and very much in need of attention. I shut the door quickly! Our crew set up our toilet tent some distance away. 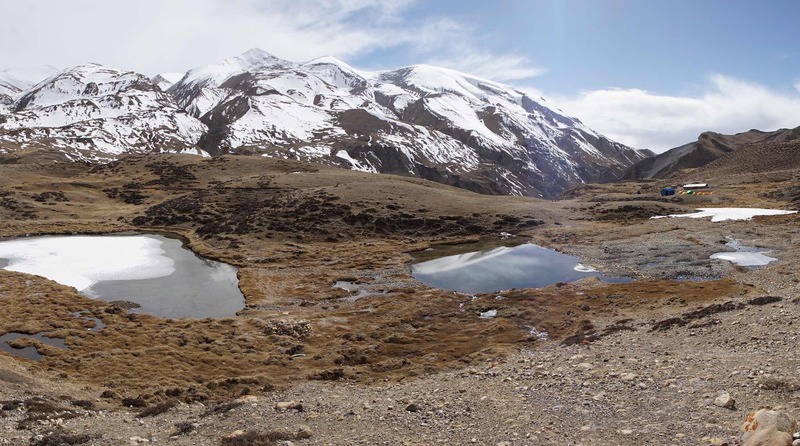 To the south of the site flows the Namta Khola. 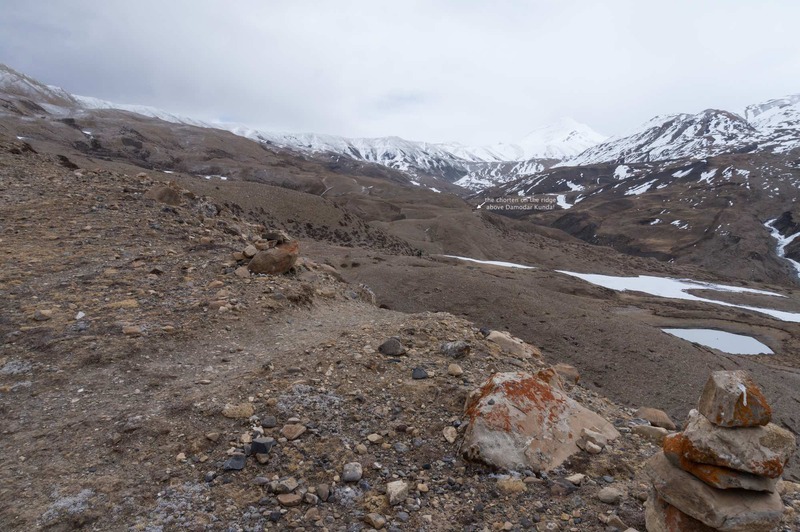 The next morning we would follow the river up to the beginnings of the Khumjungar Glacier and our campsite at Japanese Base Camp. Tents up and duffel emptied, I set off for a walk around the site. 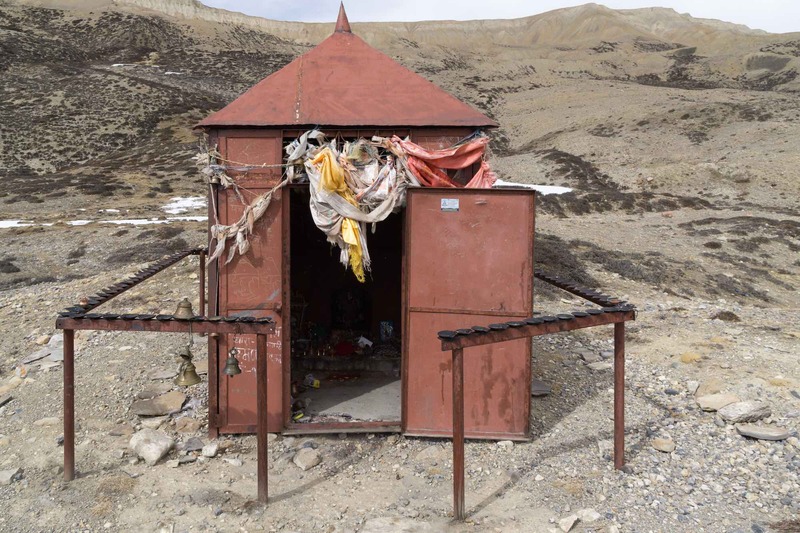 First up was the shrine and then the two kunda – Rajat and Neel – nearby. 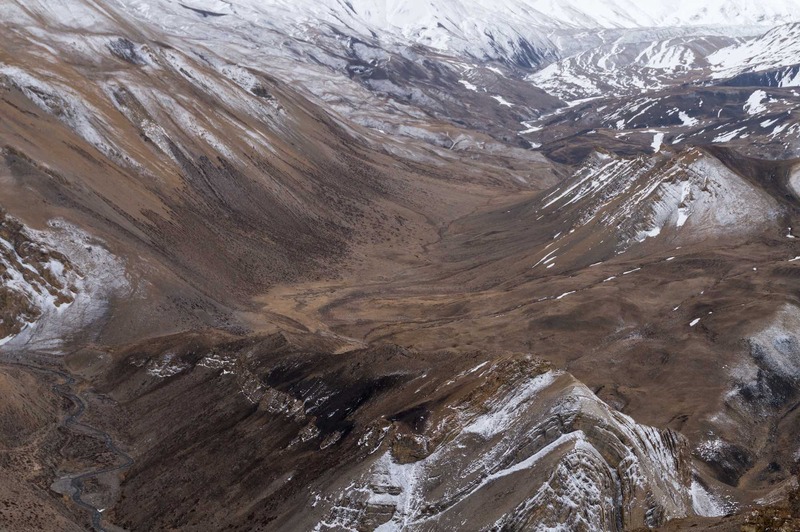 I thought back to the words of the woman we had met at Ghuma Thanti as she waited for the helicopter at the end of her unsuccessful expedition. She had expressed disappointment at the tiny size of the Damodar “lakes” she had expected to see. I saw her point! Given that they are not much bigger or deeper than puddles, the term”lake” hardly seems appropriate. However, to the faithful who endure hardship to come here the size of the kunda is not an issue. They believe they are at the very source of the Kali Gandaki. The ponds’ significance is exponentially increased by the belief that the god Vishnu, also known as Narayan, exists in the pool in aniconic form as a shaligram and that to bathe in the holy water is to have the karma of a lifetime wiped clean. Few spiritual people there, were delighted by our presence and reminded us that is great fortune to visit this auspicious place on earth. This place is not known to many and hence has maintained utmost sanctity. It is said that reaching this place itself is the rarest opportunity for a human-being and comes after continuous prayers of many lives (janmas). Doing Shradda / Til tarpan wipes out accumulated sins of past lives of our ancestors and paves way to reach Mukti (heaven). As referred in Puranas & blessed by Lord Krishna, those who take bath here, their soul gets mukti/moksha in the future. It is surprising to note that the average number of pilgrims visiting this sacred place is only 3 per day. 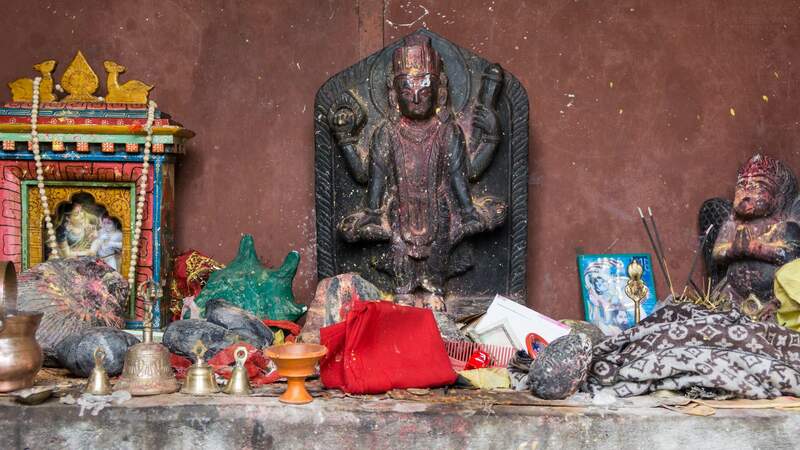 Inside the shrine, a four-armed Vishnu figure stands at the center. In his hands, he holds different objects (clubs, a possible conch shell, a discus?). 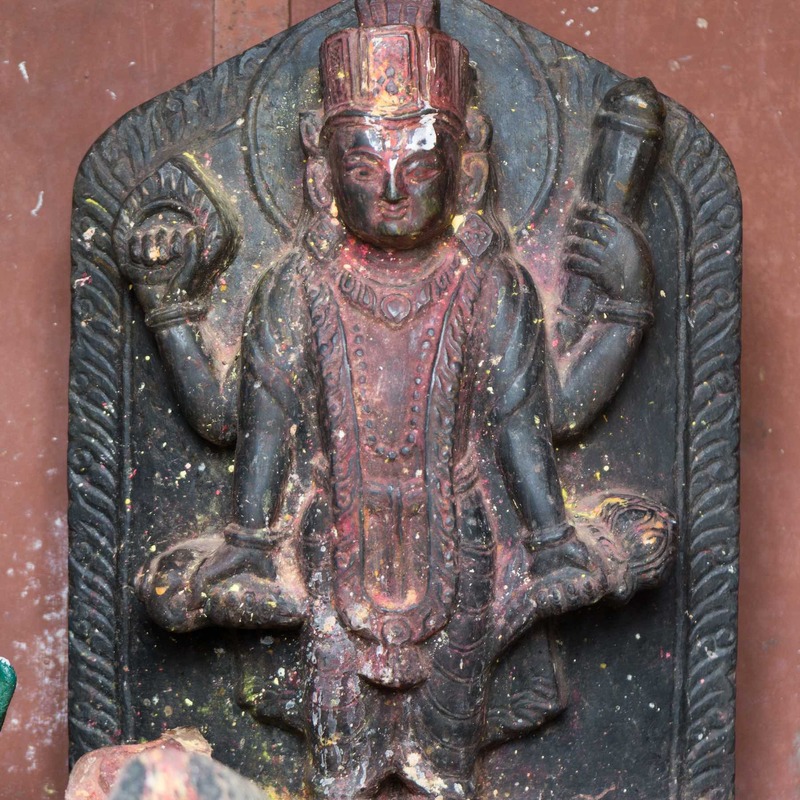 Devotees have smeared red powder on the surface of the statue. Below the shrine to the south are the two ponds. Our porters spent some time circling the one on the left. It is the pond that gets most of the attenton from pilgrims. 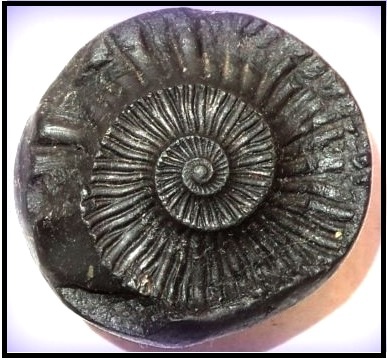 They were looking for the Vishnu shaligram said to be in the pond but if it is indeed there they could not see it, perhaps because of the ice which covered half the surface. 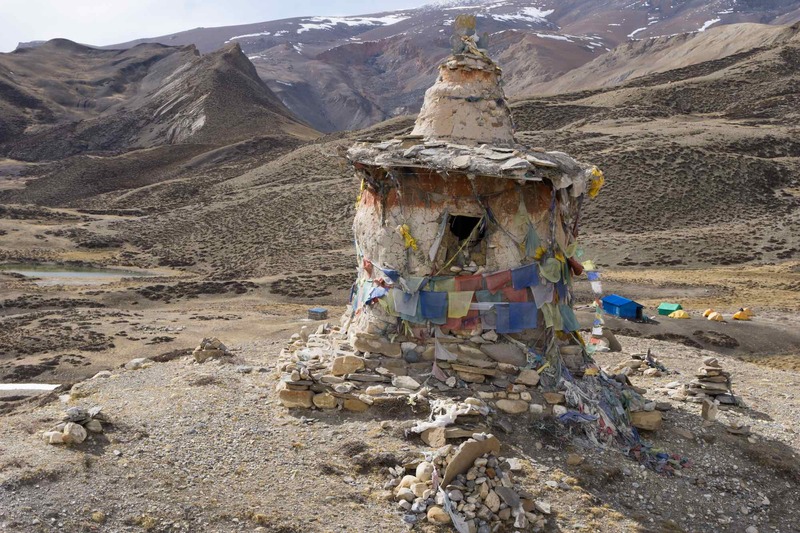 Above the ponds and the campsite is a chorten draped with Tibetan Buddhist prayer flags. 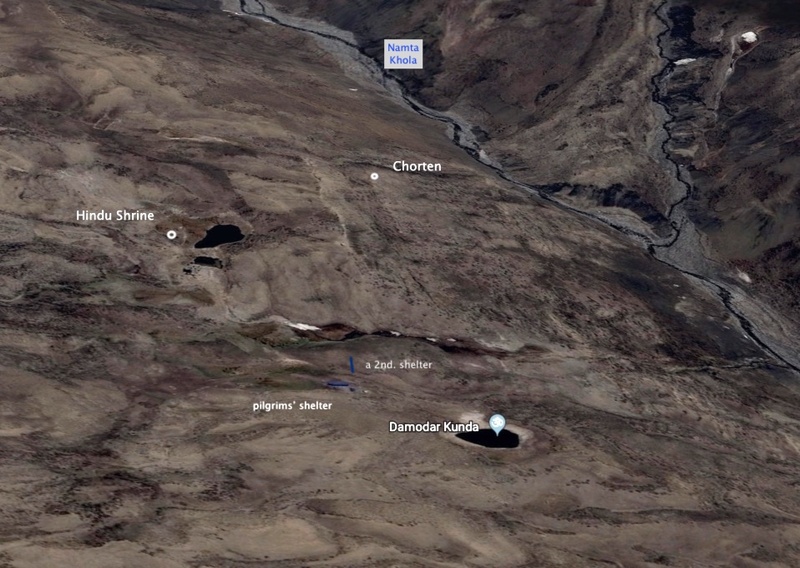 It would seem that the site, like Muktinath to the south, has significance for Buddhists too. 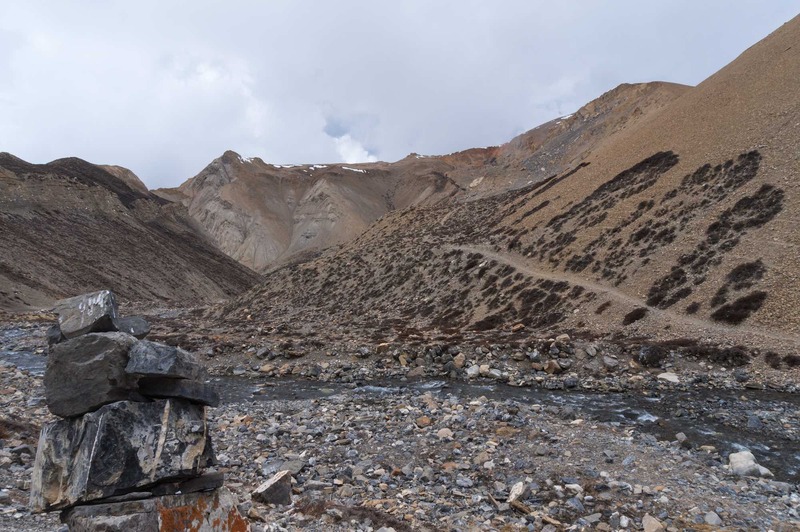 Visible in the image above is Tamra Kund, the third small pond, which is below and to the left of the chorten; it was the first one we passed on our way to the tent site. On the wall of the newer shelter a helicopter crew had taken the time to write their names. 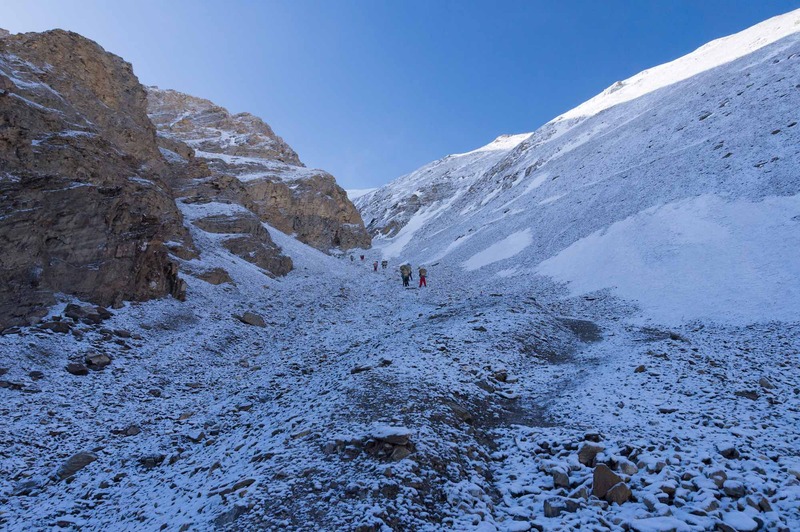 Instead of a long and difficult trek from Jomsom to Damodar Kund, Hindus can make a helicopter pilgrimage! I had read about these ‘copter visits and wondered if we would be blessed with one during our stay at the site. The thought that you could – with enough rupees – buy moksha brought to mind the selling of indulgences that prompted the Protestant Reformation in Europe. Of course, in the Damodar case, private entrepreneurs and not a corrupt Hindu hierarchy are the ones selling salvation. While the pilgrims may leave behind bad karma, they also leave behind all sorts of garbage. 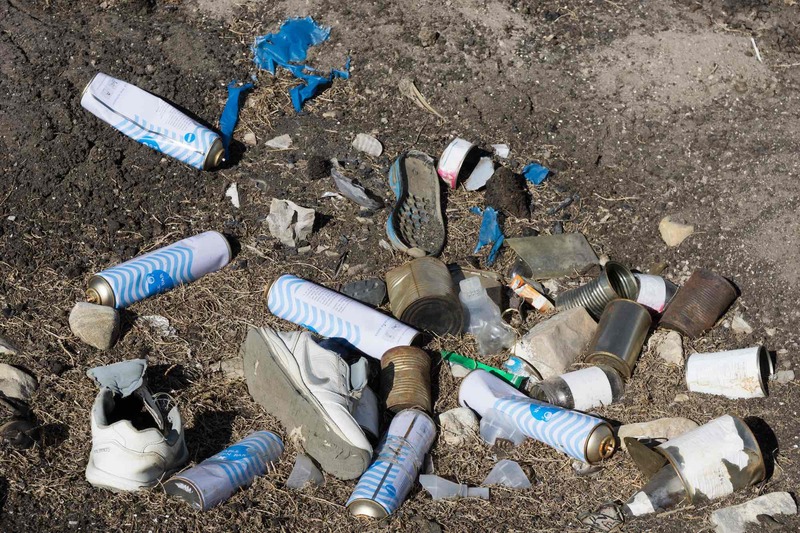 In the image below, those are oxygen canisters used by passengers who have flown from Jomsom at 2600 meters to this site at 4990 for a quick one- or two-hour visit. Damodar Kunda – take nothing but photos, leave nothing but prayers! 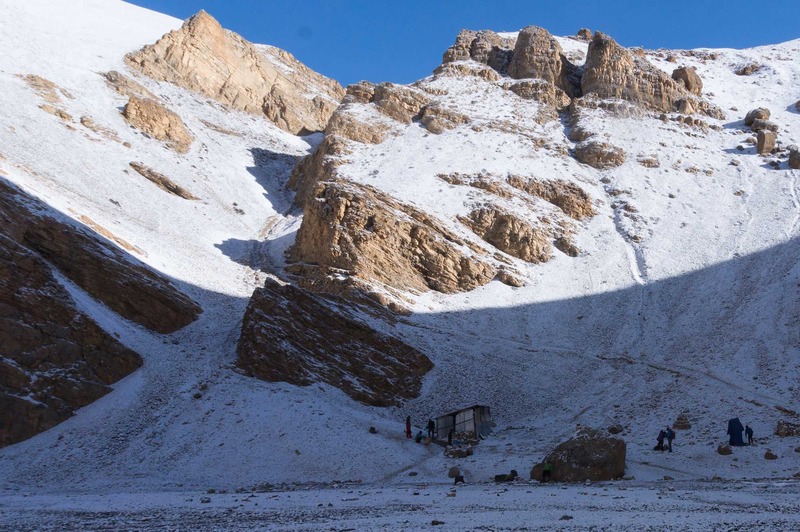 The first phase of our trek – the walk up the Kali Gandaki – had taken us five days. Now with the end of Day 10 the second phase – the Hindu pilgrims’ trail from Yara – was also done. Beginning with Day 11 we were moving into the mountaineering phase of our multi-faceted walk. 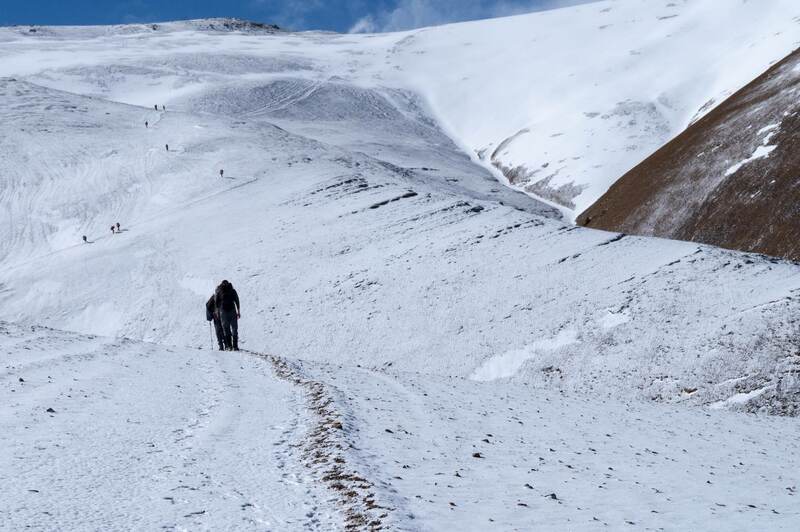 We were heading to the Khumjungar Glacier and some more altitude gain. A Problem With The Nepal Govt Survey Dept. Map! 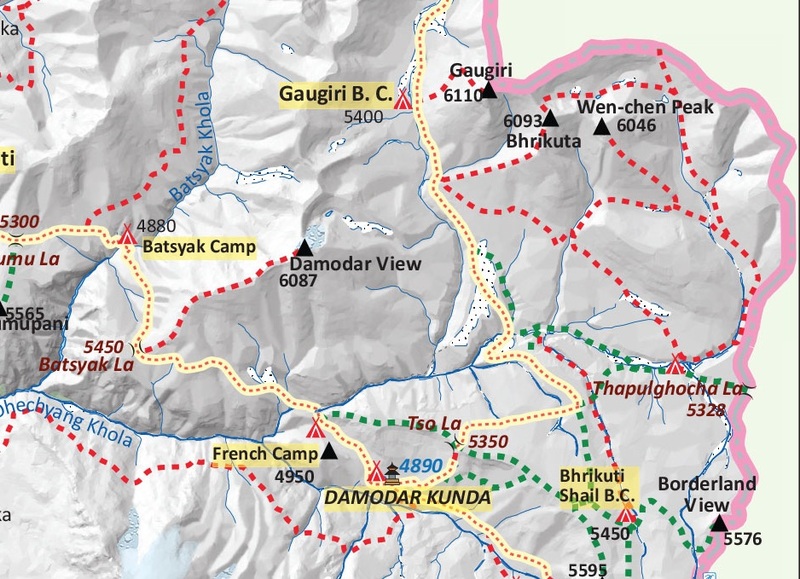 The 2001 edition of the Nepal Government’s Survey Department map (done with the Finnish Meteorological Institute) has Damodar Kund in the wrong place! 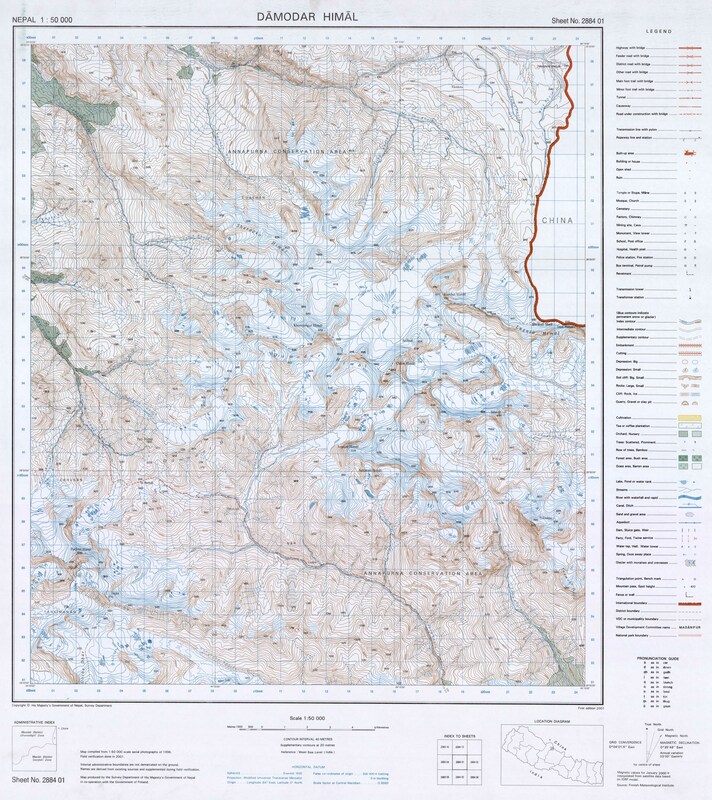 Take a look at the Himalayan Map House map below; note how the trail from Batsyak Camp goes south to Batsyak La and then in a south-easterly direction to the Damodar Kunda. 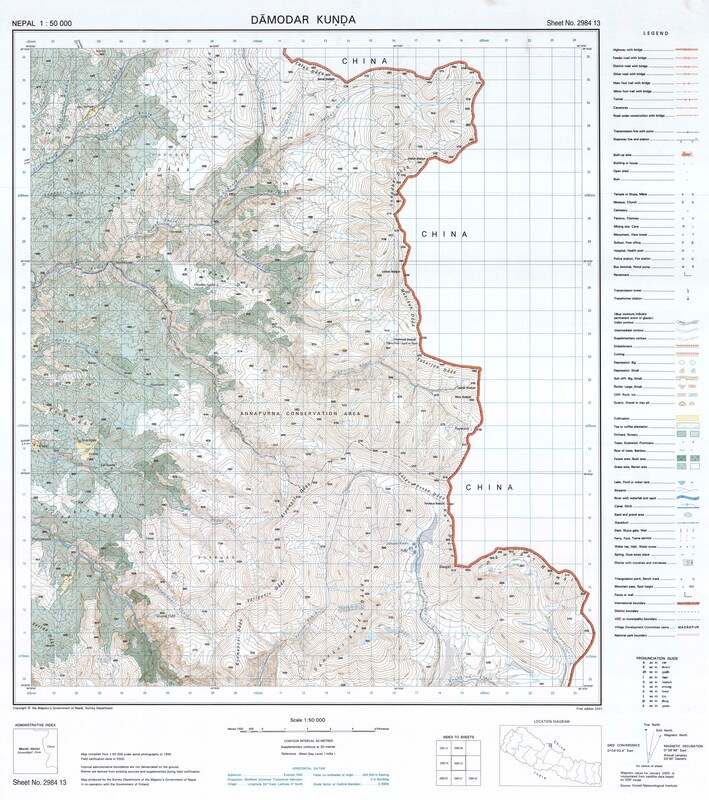 Now look at the official Nepalese Govt topo. It too indicates the trail from the Batsyak Camp at Parsye Khola to the Damodar Kunda. 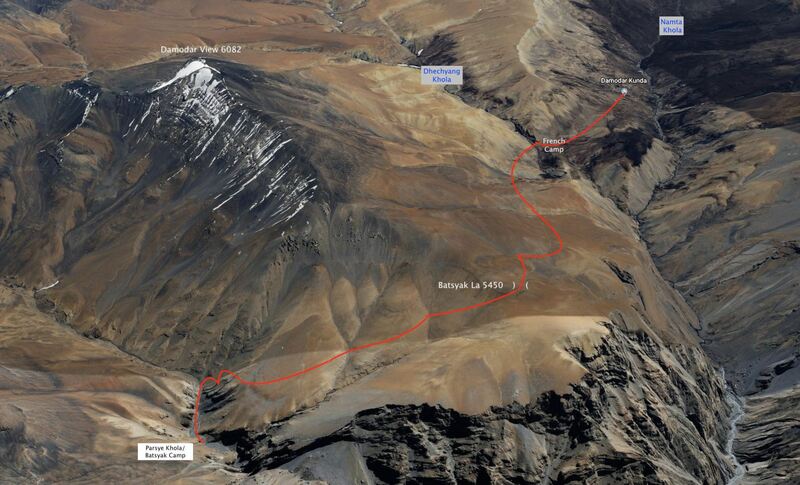 However, its trail leads you to a location just northwest of Gaugiri. And if there are indeed three little ponds to be found there, they are not the Damodar Kunda! 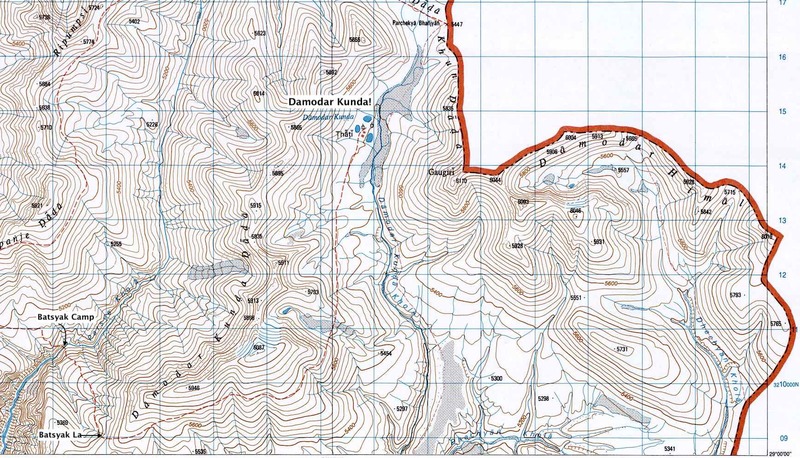 Turning to the Nepal topo 2884 01 (Damodar Himal), the actual location of the Damodar Kunda would be the small pond on the map below. 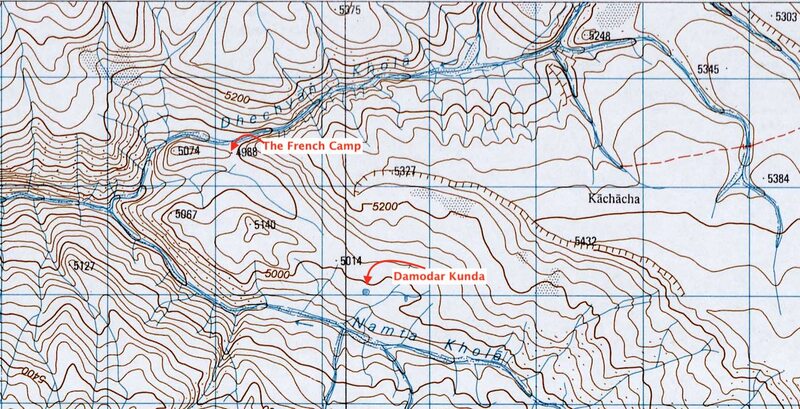 I’ve labeled the French Camp location as well as that of the Damodar Kund.